So you're cooking up a gorgeous holiday spread and you've bought a little package of fresh rosemary sprigs. Once the turkey or the lamb leg is rubbed and the stuffing is flavored and the rolls have been brushed with butter, salt and a little pinch, you've usually got the greater part of a package of fragrant rosemary left and nothing to do with it. Until now. 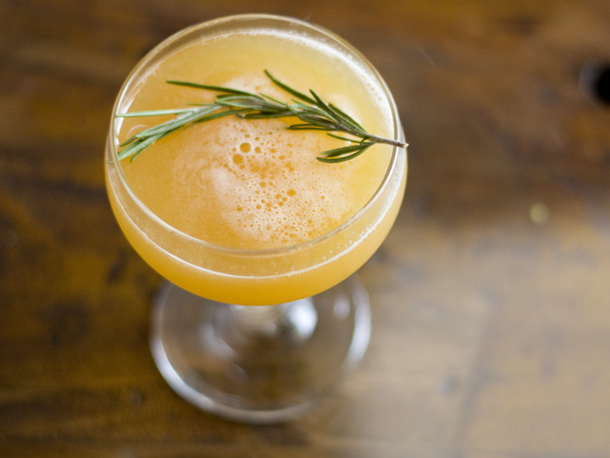 Muddle peach slices and a rosemary sprig in a shaker, then add ice, bourbon and lemon juice. Shake for 10-15 second, then strain into a chilled cocktail glass. Garnish with a rosemary sprig. Notes: Use whatever bourbon you have on hand, and feel free to subsitute peach for nectarine in the stone fruit selection isn't at its best. You could even skip muddling the rosemary if you slapped the sprig used for garnishing vigorously enough, but to each their own. Cheers! Image and recipe inspired by Kelly Carámbula of Remedy Quarterly for Serious Eats. PERFECT. And now I want lamb. this sounds amazing. am going to try it for an upcoming christmas party. Lena, this looks smashing and festive. Good one! This sounds delish! I had a rosemary bush in my backyard and we got so much use out of it! Peach, lemon, and rosemary...sounds yummy! Oh heck yeah. Pinning!! I think I've mentioned before that I'm not much of a bourbon girl (though hubby is). However, this sounds so fresh and lovely it might be just the drink to change my mind!